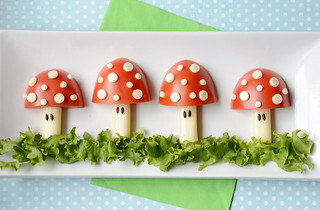 This cute snack is made with lycopene-rich tomato and cheese (a good source of calcium), making it adorable and healthy! 1. Tear up Boston lettuce and place the lettuce on the bottom of your plate. 2. Grab your mozzarella cheesestring and cut it into 4 equal pieces. Place these pieces just above the lettuce. These will be the mushroom stems. 3. Using your knife, slice Roma tomato both horizontally and vertically. This will give you 4 equal quarters. Place 1 tomato slice on top of each mozzarella cheese stem. 4. If you have them, take your mini circle cutters and cut many circle shapes out of your slice of mozzarella cheese. Place these tiny circles all over the tomato mushroom tops until they are full of spots. You can optionally cut circles out of your cheese using a knife. 5. Place 2 sesame seeds on each mozzarella cheese stem to give your toadstools some eyes for a little personality! These little toadstools are almost too cute to eat – almost. My kids gobbled this whimsical snack right up! Enjoy!